Previously, we explored using the INDIRECT function to refer to various tables in a workbook. In this follow-up post, we’ll expand the discussion and refer to individual table columns. Let’s start with our objective. We have several tables in a workbook. They have the same structure and store department data. For example, here is the Department A table. We would like to be able to select the table AND the column from drop-down controls, and have Excel use the selected table and column in a simple SUM function as illustrated below. First up, let’s figure out how Excel’s structured table references work. A Structured Table Reference (STR) allows us to refer to a specific area within a table, such as a specific column. STRs begin with the table’s name followed by the specific area enclosed in square brackets . Referencing a specific column is accomplished like this: TableName[ColumnName]. For example, to refer to the Q1 column in the DeptA table, we would use: DeptA[Q1]. In addition to referring to specific columns, we can refer to specific rows. For example, to refer to just the header row of the DeptA table, we could use DeptA[#Headers]. To get a list of the available STRs, type the table’s name in a formula and then type the open square bracket. 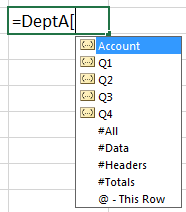 Excel will display a list of valid STRs in the auto-complete list, as shown below. Now that we know the anatomy of STRs, let’s move on to the drop-down cells. To create the drop-down controls, we’ll use the data validation feature. The drop-down control in C6 is generated with the Data Validation feature by allowing a list equal to the table names. Setting this up was discussed in the previous post. The drop-down control in C7 is generated with the Data Validation feature by allowing a list equal to the column names. To do so, select the input cell C7 and then the Data Validation ribbon command. Set it to allow a list equal to the column labels you’d like to be displayed, as shown below. At this point, all that remains is to write the formula. We need to create the desired reference with a text string and then pass it to the INDIRECT function. The INDIRECT function will convert the text string into a valid Excel reference. For example, let’s say that we ultimately wanted to sum up the Q1 column of the DeptA table. We could use the following formula. =C6 & "[" & C7 & "]"
Note: spaces are shown in the formula above to make it easier to read. Assuming DeptA is stored in C6 and Q1 is stored in C7, the formula above returns the desired STR, DeptA[Q1]. To convert the STR into a valid Excel reference, we’ll use the INDIRECT function, as follows. Finally, we’ll sum the cells in the reference with the SUM function, as follows. This will compute the sum for the selected table and column, as illustrated below. If you have any additional ideas or methods, please share by posting a comment below! I’m using your approach to create dynamic features built into a dashboard. I’m attempting to make the STR [column specifier] be determined based on the output of a form control….. without success. Will this approach work with other formulas such as SUMPRODUCT. Yes, the INDIRECT function should work in functions where a typical range reference is expected. What I would like to do is create a conditional lookup so that if someone types Fruit into cell A1, then the dropdown on cell B1 only shows the options Apple and Pear. I know I can do this by creating a table for Fruit and another table for Veg but I would like to keep all the data in a single table. The reason for this is the actual problem I am solving is more complex than my example with 4 columns ie 4 levels of data. Any suggestions would be gratefully received. I’ve spent several evenings trying to figure out how to convince Excel that my chosen dropdown value needed to be read as a columnheader, so I could create a second dropdown based on that column. Without any previous knowledge of Excel and the proper terminology it has been extremely difficult to figure out. This bit “So, we would build the STR using the concatenation operator (&), as follows:” finally got me my solution. THANK YOU SO MUCH! I’ve build a spreadsheet containing one master data table with one column per month and one student name per individual row in the first column. The month‘s headers are named using thé twelve months names. There are twelve additionnal tabsheets, named as well using the same months names. My goal is to retrieve the student‘s hours per month stored in each monthly tabsheet, and to report them into the master data table. I succeeded doing the job using a vlookup and an indirect function which takes the header string into account in order to search into the relevant tabsheet., i.e., INDIRECT(J$1), where J1 contrains „April“ for example. To make it more robust, I would like to use the [#Headers] and [#This Column] instead of the hard coded cell reference. Would you know which syntax to use for such a purpose? When I test it here, it returns the corresponding column label correctly for each table column.